Pre AVG: Graduated from Bowdoin College, Maine, in 1939. In 1940 was commissioned as a 2nd Lieutenant in the Army Air Corps Reserves at Kelley Field, Texas. 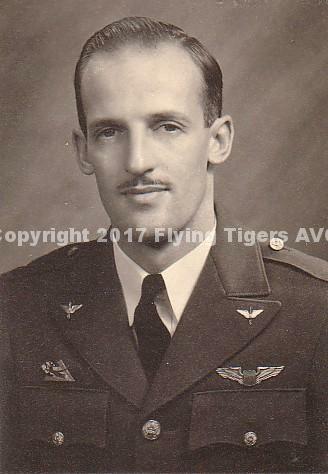 Served as a flight instructor in Texas prior to resigning his commission to join the American Volunteer Group in 1941. AVG Service: In September of 1941, he left San Francisco aboard the Dutch liner Zaandam bound for Rangoon, Burma, and finally Yunnan-yi, China, as a flight instructor for the Chinese Air Force. He fought with the AVG as a wingman for the First Pursuit Squadron until the group disbanded on July 4th, 1942. He volunteered for an additional 2 weeks duty as the transition from the AVG to the 14th Air Force was completed. Loane piloted with CNAC until September 30, 1947, having logged over 4000 hours in the C-46, C-47, and DC-4 airplanes. He then became a pilot for CAT and continued flying in China until the communist takeover. After returning to the States, he was hired by the Flying Tiger Line and flew as a Captain until retiring in 1977. He passed on to “Hogy Taw” in January 1978.